Are you one of those people who believe that creativity is out of your reach? Nothing could be further from the truth! 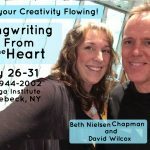 Come join us at Omega July 26th through July 31st and let David Wilcox and I show you how to connect to the gifts you hold within yourself. This workshop is truly inspiring and magical for everyone, not only songwriters! Redefine your relationship to your fear and your inner-critic as you open up to creative flow, finding your unique voice, the power of your story and your freedom to play and discover from the center of your heart. Here are some pictures from the last couple of years. We can\’t wait to be back again! Hope to see you there! To read all about it and register click here. ← The Dance of Parenting: Happy Father’s/Mother’s Day to a Son and Daughter-in-law from Grammy!